Some have suggested that when Janet Yellen’s term as Federal Reserve chair expires in 2018 then Donald Trump will try to replace her with a more “hawkish” chairman. Some even has suggested that he could try to re-introduce the gold standard and appoint the king of monetary policy rules John Taylor as new Fed chairman. I, however, believe that is completely wrong. Donald Trump doesn’t care about the Gold Standard (luckily) and certainly he does not care about a rule-based monetary policy. The fact is that Trump’s entire policy agenda is inflationary. On the supply side his anti-immigration stance will push up US labour cost and this protectionist agenda will push up import prices. On the demand side his call for underfunded tax cuts and massive government infrastructure investments also increase inflationary pressures. So if unchecked (should write un-offset by the Fed?) Trump’s economic policy agenda will push inflation up. However, Trump does not – yet – control monetary policy and if the Federal Reserve is serious about it’s 2% inflation target it sooner or later will have to offset the Trumpflationary policies by hiking interest rates potentially aggressively and allow the dollar to strengthen significantly. I have argued (see here and here) that initially the Federal Reserve will welcome a “fiscal boost” to support aggregate demand as the Fed for some odd reason is not willing to use monetary policy to hit the 2% inflation target. However, the alliance between the Trump administration and the Federal Reserve could be short-lived if inflation expectations really start to take off. So in a situation where the Fed moves to hike interest rates more aggressively – for example in the second half of 2017 or in early 2018 it will become clear even to Trump that the Fed is “undermining” his promise of doubling US growth and “create millions of jobs”. That could very well create a conflict between the Fed and the Trump administration and it is very likely that Trump will accuse Yellen of have too tight a monetary policy. Furthermore, with mid-term elections due in 2018 the Republicans in the Senate and the House are unlikely to be cheering for a “growth killing” tightening of monetary policy. As I have repeated on the social media over the last couple days – the GOP is (deflationary) “Austrians” when they are in opposition and (inflationary) “Keynesians” when they are in power – they never really favour monetarist and rule-based policies. After all it was Richard Nixon who famously said “we are all keynesians now” – or rather this is how Milton Friedman interpreted what Nixon said. Nixon of course had the utterly failed Fed chair Arthur Burns (see more on Burns and Nixon here) to do the dirty work of easing monetary policy when monetary policy already was far too easing. If Trump reminds me of any US president it is Nixon. So why should we believe Trump would replace Janet Yellen with John Taylor when he can find his own Arthur Burns to help him support his agenda with overly easy monetary policy ahead of the 2020 presidential elections? If this hypothesis just has a small probability of being right then the market certainly is right is to price in higher inflation during a Trump presidency. I certainly hope I am totally wrong. PS for a discussion of Nixon and Burns’ relationship seen Burton Abrams very good (and scary) paper How Richard Nixon Pressured Arthur Burns: Evidence From the Nixon Tapes. PPS Paul Krugman once called for Ben Bernanke to show up for a FOMC press conference in a Hawaii shirt to signal that he would be “irresponsible” and thereby push inflation expectations up and lift interest rates from the ZLB. Maybe Trump is that Hawaiian shirt. The global stock markets are taking yet another beating today and as I am writing this S&P500 is down nearly 3.5% and the latest round of US macroeconomic data shows relatively sharp slowdown in the US economic activity and more and more commentators and market participants are now openly taking about the risk of a US recession in the coming quarters. Obviously part of the story is China, but at the core of this is also is the fact that Fed chair Janet Yellen has been overly eager to interest rates despite the fact that monetary and market indicators have not indicated any need to monetary tightening. It is only the defunct Phillips Curve that could led Yellen to draw the conclusion that monetary tightening is needed in the US. …Central banks temporary can impact real variables such as unemployment or real GDP, but it cannot permanently impact these variables. Similarly there might be a short-term correlation between real variables and nominal variables such as a correlation between nominal wage growth (or inflation) and unemployment (or the output gap). 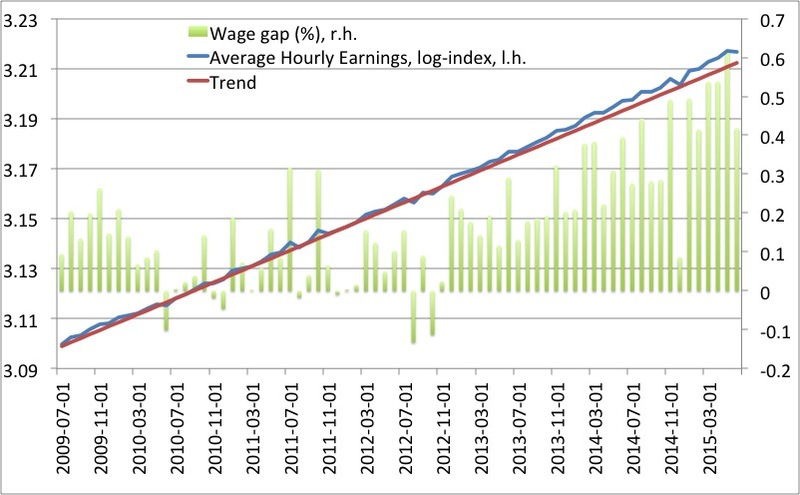 …If we look at nominal variables – the price level, NGDP, the money supply and nominal wages – the conclusion is rather clear. The Fed has actually since 2009 delivered a remarkable level of nominal stability in terms of keeping nominal variables very close to the post-2009 trend. Obviously Yellen did not get the memo and now we are exactly risking that recession that I warned about in August. And no I am not bragging about my ability to forecast. In fact I am doing the exact opposite. 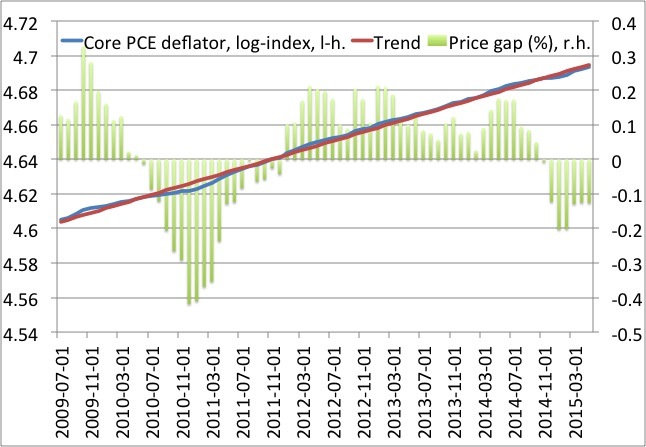 In August the markets were telling us that there was no inflationary pressures (and I was only repeating that), but Yellen has all along insisted that the market expectations about inflation were wrong and that the Phillips Curve was right. That might turn out to be a costly mistake. A history of political dysfunctionality, corruption, military coups, military conflict with a neighboring country, large current deficits and weak fiscal management. Greece fits that description perfectly well, but so does Turkey. So why don’t we have a major crisis in Turkey and why is Turkey not on the brink of default when neighboring Greece is? The answer is simple – It’s the exchange rate exchange rate regime stupid! In 2001 Turkey was forced by a major crisis to abandon it’s managed/crawling peg regime and instead introduced a floating exchange rate regime and the Turkish central bank introduced an inflation targeting regime. 14 years later Turkey is still in many ways politically dysfunctional – in fact it has gotten worse in recent years – there has been rumours of plans of military coups, there has been major corruption scandals even involving the Prime Minister (now president Erdogan) and the governing AKParty and lately the civil war in Syria has created a massive inflow of refugees and increased tensions with Turkish Kurdish population. 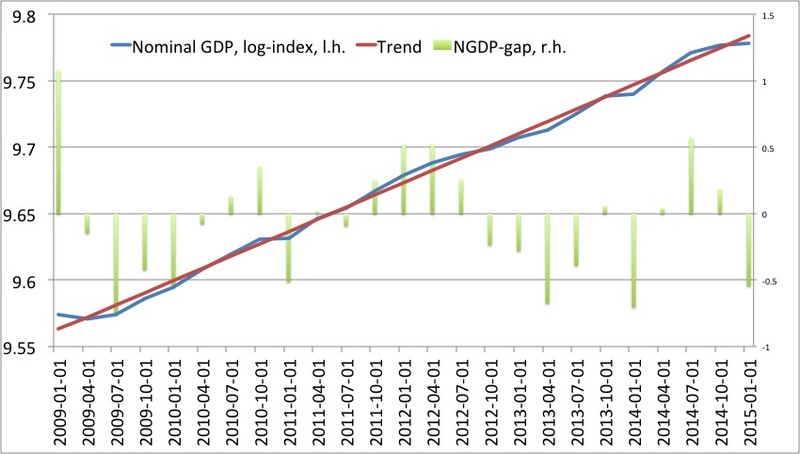 All this has to a large extent been reflected in the value of the Turkish lira, which have been highly volatile since 2001 – and increasingly so since 2008, but the floating exchange rate regime means that we have not seen the same kind of volatility in the domestic Turkish economy, which was so common prior to 2001. 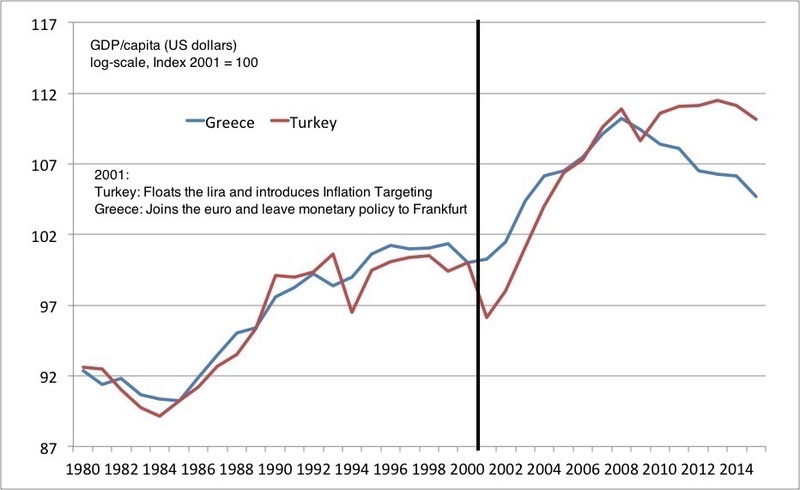 While Turkey in 2001 floated the lira Greece gave up having a monetary policy of its own and instead joined the euro. We know the story – while the first years of euro membership in general was deemed succesfull that hardly has been the case since 2008: The economy has collapsed, unemployment increased dramatically, debt has skyrocketed, we effectively have had sovereign default and we are on the brink of an euro exit. Milton Friedman used to say “never underestimate the importance of luck of nations” referring to how pegged exchange regimes might be succesfull for a while, but also that it could have catastrophic consequence to maintain a pegged exchange rate regime. In 2008 Greece ran out of luck because it made the fatal decision to join the euro in 2001. Today is it blatantly obvious that Greece should have done as Turkey and floated the drachma. 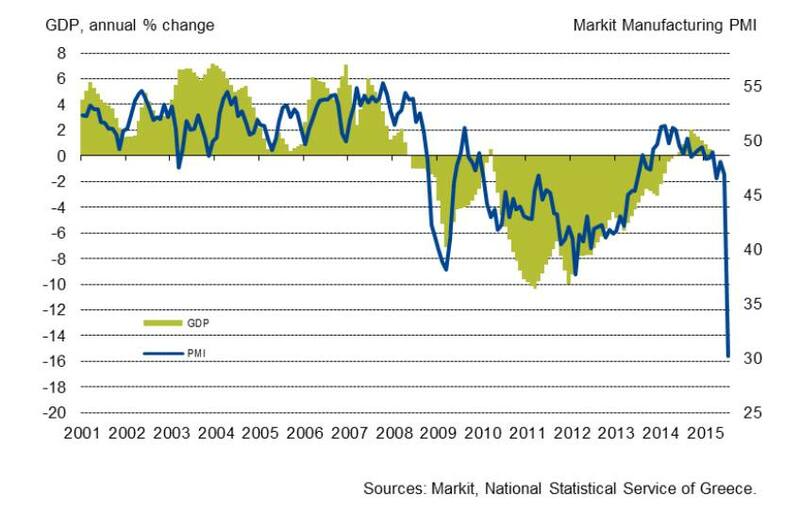 It now seems like after 14 years Greece will be forced by a major crisis to do exactly that. 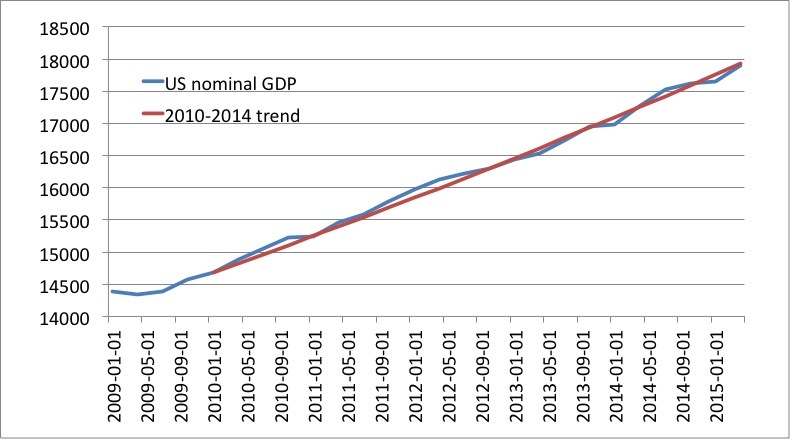 Unprecedented stimulus measures? Say what? Since ECB chief Mario Draghi promised to save the euro at any cost in 2012 monetary policy has been tightened and not eased. 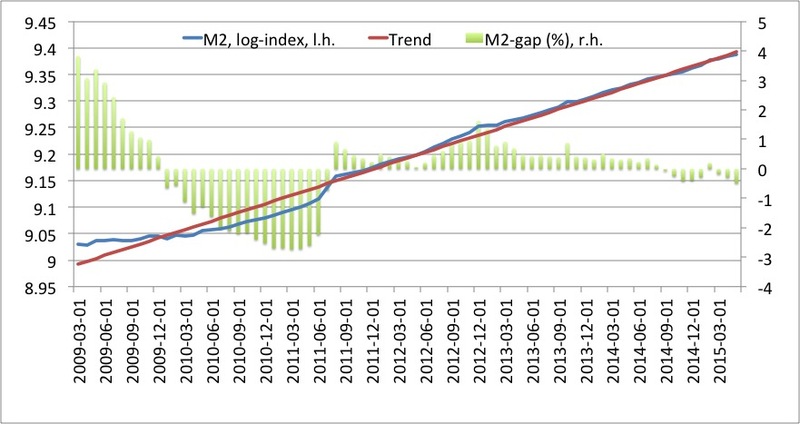 Take any measure you can think of – the money base have dropped 30-40%, there is basically no growth in M3, the same can be said for nominal GDP growth, we soon will have deflation in most euro zone countries, the euro is 10-15% stronger in effective terms, inflation expectations have dropped to all time lows (in the period of the euro) and real interest rates are significantly higher. That is not monetary easing – it is significant monetary tightening and this is exactly what the European bond market is telling us. Bond yields are low because monetary policy is tight (and growth and inflation expectations therefore are very low) not because it is easy – Milton Friedman taught us that long ago. Too bad so few economists – and even fewer economic reporters – understand this simple fact. If you think that bond yields are low because of monetary easing why is it that US bond yields are higher than in the euro zone? Has the Fed done less easing than the ECB? The bond yield fallacy unfortunately is widespread not only among Bloomberg reporter, but also among European policy makers. But let me say it again – European monetary policy is extremely tight – it is not easy and I would hope that financial reporter would report that rather than continuing to report fallacies. PS If you want to use nominal interest rates as a measure of monetary policy tightness then you at least should compare it to a policy rule like the Taylor rule or any other measure of the a neutral nominal interest rate. I am not sure what the Talyor rule would say about level of nominal interest rates we should have in Europe, but -3-4% would probably be a good guess. So interest rates are probably 300-400bp too higher in the euro zone. That is insanely tight monetary policy. PPS I am writing this without consulting the data so everything is from the top of my head. And now I really need to take care of the kids…sorry for the typos.